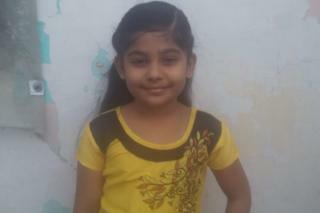 Hanifa Zaara told the police in a letter that her father had "cheated" her and should therefore be arrested. She said that she was "ashamed" to defecate outside. Many Indians do not have access to toilets and nearly 500 million defecate in the open, according to Unicef. She told BBC Tamil's Krithiika Kannan that a few people in her neighbourhood did have the facility. So she asked her father to build a toilet in their house too. She was in nursery at the time. "I was ashamed to go outside and I felt bad when people looked at me," Hanifa said. And she was especially motivated after learning in school about the health problems caused by open defecation. In her letter to the police, she wrote that her father told her he would build the toilet if she topped her class. "I have been topping my class since nursery," she wrote. "I am in the second grade now. And he is still only saying he will do it. This is a form of cheating, so please arrest him." If not arrest, she added, she wanted the police to at least force him to provide her with a signed letter saying by when he would get her the toilet. Her father, Ehsanullah, told BBC Tamil he had actually begun building the toilet, but did not have enough money to complete it. He is currently unemployed. "I asked Hanifa to give me more time but she stopped talking to me because I couldn't keep my promise," he added. But Hanifa is not sympathetic. "How long can I keep asking him for the same thing? He kept giving me the same excuse about not having enough money. So I went to the police." On Monday, she went to the police station closest to her school, along with her mother, Mehareen. "She came with a bag filled with trophies and merit certificates and she arranged them on my desk," police officer A Valarmathi told BBC Tamil. "And then she said, can you give me a toilet?" Ms Valamarthi says she called Mr Ehsanullah, who rushed to the police station, worried that his wife and daughter were in danger. He says he was shocked to find out the reason he had been summoned. After reading the detailed letter Hanifa had written, he said she seemed to have learned how to write official letters by watching him. Mr Ehsanullah often helps villagers fill out paperwork and write letters to local officials and lawmakers. "I never thought this would backfire against me!" he said. Hanifa's efforts have won the sympathy and support of the police. "Her complaint was very honest, so we tried to resolve the issue," officer Valamarthi said. She alerted district officials who now plan to raise money to build more than 500 toilets in Hanifa's neighbourhood. "We were very happy to see her complaint. We organise classes in schools to encourage children to ask their parents for toilets at home," city commissioner S Parthasarathy told BBC Tamil. He said they also want to make her the local face of the national Swachh Bharat Abhiyan (Clean India Campaign). The government has set a goal to provide every household with a toilet by 2019, but the work has faced some resistance. A recent study found that 89% of rural Indians defecate in the open because they do not want to clean toilets or live close to one - an attitude which, researchers say, is "rooted in the social forces of caste and untouchability". For centuries, the practice of cleaning human waste was a task performed by those from low-caste communities. Hanifa said she was "very happy" with the result of her letter. She hadn't been speaking to her father for the last 10 days but the police brokered peace between them: Hanifa and her father finally shook hands.